Researchers from the SUNY College of Environmental Science and Forestry (ESF) are involved in two projects that could lead to improved communications between officials who issue information about coastal storm hazards and the residents who live in areas where storms pose a threat. The two social science research projects are among 10 that received a total of $1.4 million in funding from Connecticut Sea Grant, New Jersey Sea Grant, and New York Sea Grant. The overall goal is to improve community understanding and response to coastal storm hazard information as part of the NOAA Sea Grant Coastal Storm Awareness Program (CSAP). The projects received about $150,000 each. In funding the projects, Sea Grant noted that despite the unparalleled accuracy of the forecast before Superstorm Sandy hit the Mid-Atlantic coast of the United States in October 2012, many coastal residents either failed to fully understand the severity of the storm and the dangerous conditions it would produce, or chose not to evacuate in spite of the serious risks of staying in their homes. Eventually, the storm caused nearly 300 deaths in seven countries and caused more than $68 billion in damage. "When people fail to evacuate after storm warnings, their decision-making process is not always rational," said Dr. Sharon Moran, an ESF geographer who is the principal investigator on the ESF-led project. "We want to understand what needs to be done to help them make better choices." Moran's project is titled "Understanding Responses to Storm Warnings: Learning from Those Who "Rode Out" Hurricane Sandy." "Emergency response managers have collected lots of data about the 'who' and 'where' regarding the people who would not or could not leave their homes," Moran said. "What remains unclear is their decision-making process: how did they understand the threats they faced? We want to find out how they considered their options. Were statements of authorities trusted or dismissed?" A special focus of the study will be people with disabilities. Moran said more than half the people who died during Superstorm Sandy were elderly or disabled. "There were reports of wheelchair ramps that were never unlocked, buses that never came, people in wheelchairs who had to go back to their homes," she said. "We need to understand more about the risks they faced." Moran's team will consult key stakeholders, conduct focus groups, run surveys, analyze data and then build training modules and pilot them with coastal managers. Moran's co-principal investigator is Dr. William Peace, an anthropologist with the Renee Crown Honors Program at Syracuse University. They are working with Dr. Sam Ratick of Clark University as associate investigator and Dr. Rebecca Garden of SUNY Upstate Medical University as a consultant. ESF is also involved in a project focused on developing hurricane forecasts that utilize a new storm surge inundation map. The project, titled, "Measuring public responses to a surge of information: How individuals understand, react, and respond to storm surge media messages," is headed by Dr. Clifford W. Scherer of Cornell University, the lead institution on the project. He is working with Dr. Laura N. Rickard of ESF. 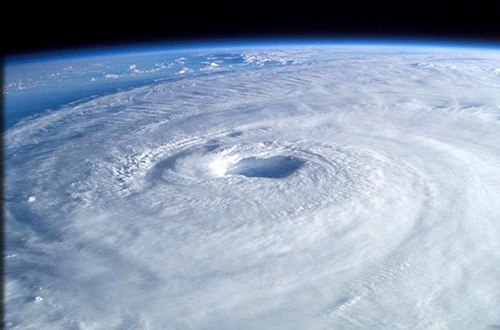 The research team will work with tri-state broadcasters, as well as partners at the National Hurricane Center and local National Weather Service offices to develop an experimental weather report to show focus groups in the three states. Participants will watch the report and indicate when they feel a hurricane risk might affect them. The goal is to better understand how New York, New Jersey and Connecticut coastal residents perceive hurricane-related and storm surge-related risk. "The National Hurricane Center has made great strides in designing a new storm surge inundation map, to be introduced in the 2014 hurricane season, that visually displays the predicted amount of storm surge above ground at each specific location included in a hurricane track. Our research will complement this effort by testing how audiences perceive hurricane-related risk when this graphic is used in a live television broadcast," Rickard said. For example, she said, given the mix of visual and auditory information provided in any given forecast, how do individuals perceive the risk that is most relevant to them for making decisions, such as whether to evacuate an area? "As risk communication scholars, we are particularly interested in how messages, such as the storm surge inundation map, may convey both risk and (un)certainty, and how the content of the message may be interpreted in both intended (on the part of the sender) and unintended manners," she said. The research team is also conducting a survey of coastal residents in the three states to gauge relevant social variables, such as past experience with hurricanes and storm surge, trust in information sources, and attribution of responsibility for response to severe weather events. Project results will help develop the best methods for practitioners on how to convey visual information about storm-related risk. Overall, the 10 projects funded by Sea Grant will study community response to disasters by closely examining the coastal storm warning systems, the information conveyed (what to expect, when to expect it, and what to do) and the factors that affect whether recipients of this information decide to act on it. The results of this research will improve the communication of coastal hazards to both the general community and to community leaders.